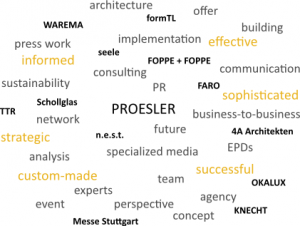 Proesler Kommunikation is a PR agency with conceptual strength and specialist expertise. We have a sound knowledge of the construction industry, future technologies and sustainable management. As an external press office or supplier for individual projects, we create tailored PR strategies and communication concepts. Our customers benefit from our passion for challenging topics and target-oriented solutions. Our strength is the provision of strategic advice to companies and the implementation of successful PR concepts in their relevant target groups and markets. If you want to raise the profile of your projects in German-speaking regions, talk to us. You will benefit from our sound understanding of the topics, our wealth of ideas and the meaningful combination of PR instruments and budget-appropriate measures.